LONDON â Aug. 11 2014 â Northrop Grumman Corporation (NYSE:NOC) has entered into a collaborative partnership with Cyber Security Challenge U.K. under which it will bring the proven U.S. national youth cyber education programme, CyberPatriot, to the U.K. for the first time as part of the company's commitment to promoting science, technology, engineering and mathematics (STEM) education, and to help build the U.K.'s pool of talent in cyber security. The partnership brings together Northrop Grumman's industry leading expertise in cyber security with the experience of Cyber Security Challenge in how to build new ways to inspire and nurture cyber talent at all ages. The competition programme will be known in the U.K. as CyberCenturion. "Promoting education in STEM is a core focus for Northrop Grumman and this partnership provides a fantastic opportunity for us to demonstrate how we can apply our industry leading knowledge and experience in cyber to stimulate an interest in STEM and help build the U.K. talent pool in cyber security," said Andrew Tyler, chief executive Europe, Northrop Grumman. "We look forward to working together with Cyber Security Challenge U.K. and to CyberCenturion being as successful in the U.K. as CyberPatriot has been in the U.S. in cultivating the cyber professionals of the future." CyberCenturion, will enable young people interested in the world of cyber security to get their first real experience of the scenarios and challenges that existing professionals have to grapple with on a daily basis. It will sit between the existing Cyber Security Challenge U.K. schools programme for secondary schools, and the main competition programme, and will be designed specifically for young people who have an interest in cyber, but have yet to find a way to apply their knowledge to the real challenges that professionals face. "CyberPatriot has grown at a phenomenal rate as young people are inspired by the opportunity to learn technical cyber defence skills while also developing their skills in leadership, teamwork and communication," said Diane Miller, Northrop Grumman programme director for CyberPatriot. "This programme challenges them in new ways that will prepare them for continued academic success and for a bright future as a cyber professional. I'm thrilled that students across the U.K. will have this wonderful opportunity, thanks to the vision of Cyber Security Challenge U.K. and the support of our outstanding association partner, the Air Force Association." CyberCenturion starts in October with two tester competitions and the fully fledged game begins later in the year. It is played by teams of between four and six participants and involves downloading a virtual computer image full of vulnerabilities that could present opportunities for a cyber criminal. The teams have approximately six hours within a two-day window to identify and fix these vulnerabilities. The top six teams will advance to a face-to-face final in April 2015. 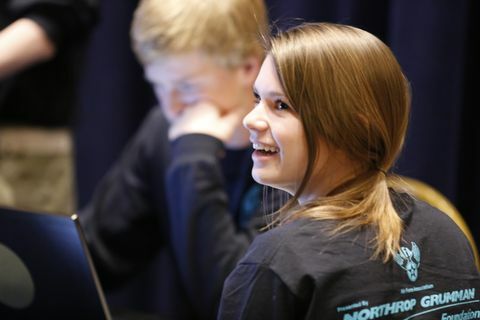 CyberPatriot, created by the U.S. Air Force Association (AFA) and sponsored by the Northrop Grumman Foundation, is a cyber security competition that has been designed to inspire future professionals towards careers in cyber security and STEM. It has already engaged more than 250,000 budding cyber professionals across the United States. Cyber Security Challenge U.K. is a nationwide programme aimed at bringing more talented people into the cyber security profession and build a bigger U.K. cyber talent pool to help address the skills shortage that affects government bodies, businesses and citizens alike.